In this Feb. 23, 2018, file photo, Afghanistan's President Ashraf Ghani speaks during the integration ceremony of TAPI pipeline in Herat, Afghanistan. The Afghan Taliban announced a three-day cease-fire over the Eid al-Fitr holiday at the end of the holy month of Ramadan, a first for the group, following an earlier cease-fire announcement by the government. 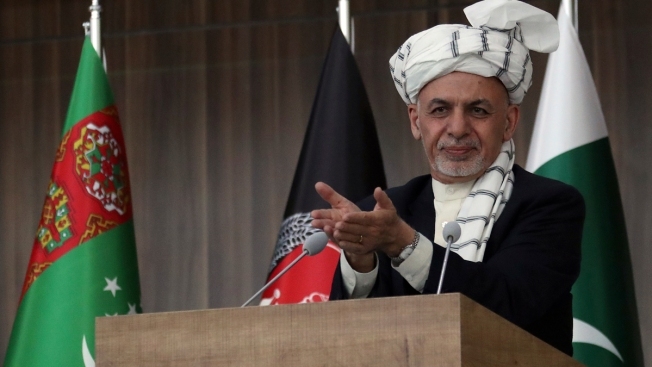 Ghani on Thursday announced a weeklong cease-fire with the Taliban to coincide with the holiday. The Afghan Taliban announced a three-day cease-fire over the Eid al-Fitr holiday at the end of the holy month of Ramadan, a first for the group, following an earlier cease-fire announcement by the government. A statement sent from the president's office on Thursday said the government's cease-fire will begin on 27 Ramadan, or June 12 on the Western calendar, and last through the Eid al-Fitr holiday, until around June 19, adding the cease-fire does not include al-Qaida or the Islamic State group. The palace statement referred to a gathering of Afghanistan's top clerics last week in which they issued a decree against suicide attacks and called for peace talks. A suicide bomber struck just outside the gathering as it was dispersing, killing at least seven people and wounding 20 in an attack claimed by the Islamic State group. The Taliban had denounced the gathering, insisting that its jihad, or holy war, against foreign invaders was justified. It instead urged the clerics to side with it against the "occupation." The conflict has been at a stalemate for several years, and NATO's best chances of leaving lie in the Taliban agreeing to peace talks and eventually joining the government. The Trump administration has sent additional troops to try to change the course of America's longest war. On Friday, senior U.S. officials said they will intensify combat against the Islamic State affiliate in the country during the Kabul government's temporary halt to attacks on the Taliban. Just hours before the Taliban's announcement, at least 17 soldiers were killed when their checkpoint came under attack by Taliban fighters in western Herat province, said Gelani Farhad, spokesman for the provincial governor.